UPDATE:Amid offensive struggles SF State’s women’s basketball team couldn’t keep up with the Cal State East Bay Pioneers, resulting in a 58-50 loss in their second-to-last game of the season. Senior guard Katie Batlin had a game high 21 points to lead SF State, but the only other Gator to accompany her in double figures was forward Lauren Varney who finished with 10 points. “We played a good game, but we didn’t make the shots that we needed to,” Batlin said. The Gators ended the first half trailing the Pioneers by only nine points, but they continued their poor shooting in the second and were not able to gain any ground. This loss eliminates the Gators from the conference playoff picture, as they currently stand at 10-11 in CCAA, two games back of the last playoff spot with one game left in the season. Although they were disappointed with the loss in such a critical game, the Gators keep their heads high and are ready to take on Cal State Monterey Bay on senior night on Saturday March 1. 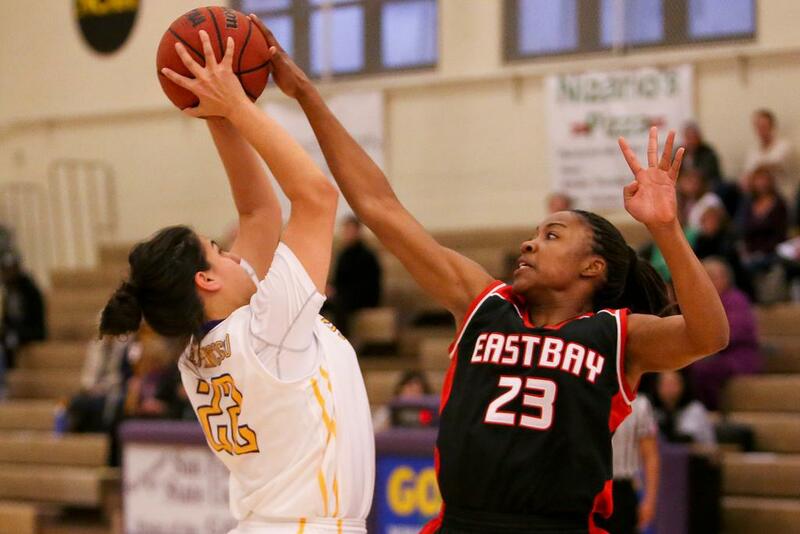 SF State could not keep up with Cal State East Bay, ending the game with a loss of 58-50. SF State had trouble putting up points with only two players scoring in double figures, guard Katie Batlin led the team with 21 and forward Lauren Varney pitched in with 10.